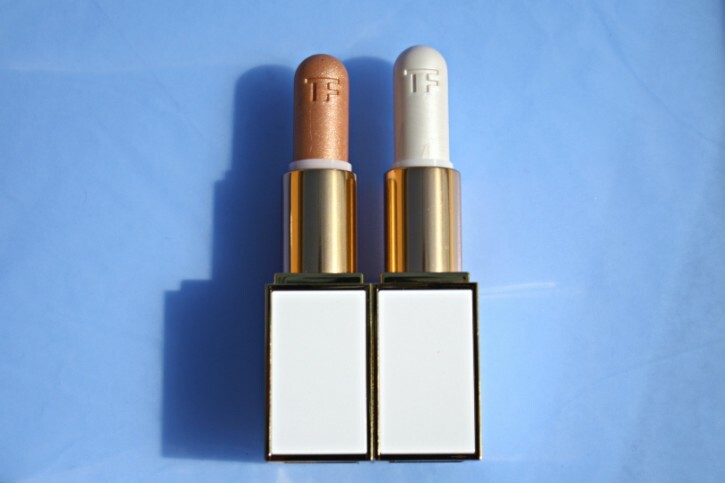 If Unabashed is the star of the 2014 TOM FORD Beauty Summer Color Collection, the limited-edition Lip Shimmers are the supporting actors. Moonlight and Solar Gold aren’t trying to make a lot of noise. They are content being background players and lingering behind-the-scenes. They aren’t splashy and they won’t make a huge entrance but they do leave a mark. The question is – how good of a mark is it? 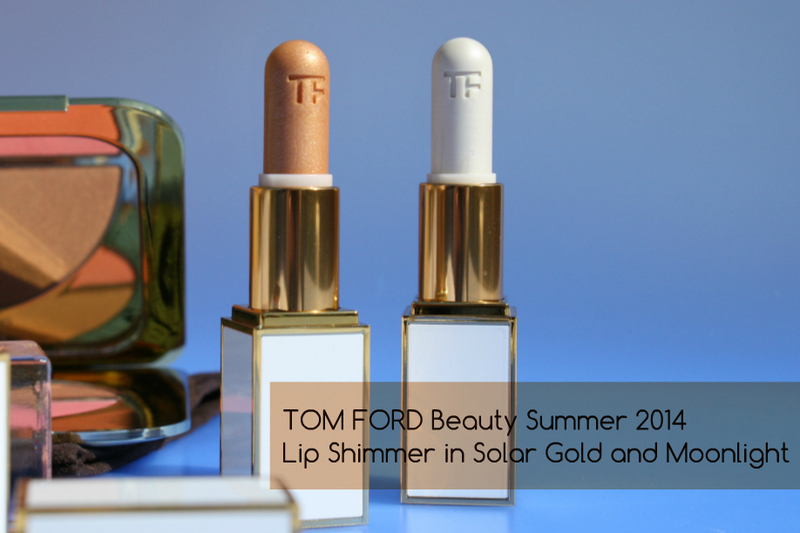 Solar Gold and Moonlight can either be “swept onto bare lips for a sultry, glimmering effect”, or veiled over your favorite lip color to add a subtle shimmer. Infused with Vitamins C and E and Shea Butter, these moisturizing lip glazes are more akin to a lip balm than lip color. They aren’t meant to pigment the lips and, accordingly, add only the barest (almost imperceptible) tint of color. Instead, these lip shimmers are all about the shine. 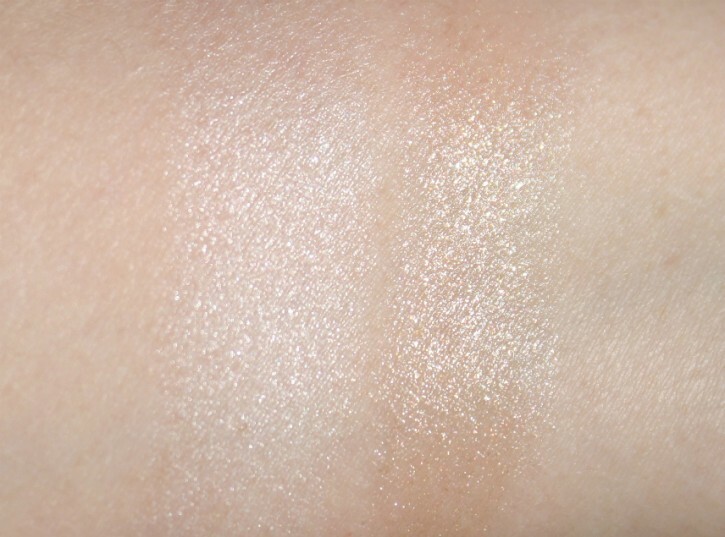 Solar Gold is a medium-toned yellow gold shimmer. The microshimmer in the bullet is visible to the naked eye and imparts a subtle sheen to the lips. My lips aren’t deeply pigmented and, worn alone, Solar Gold gives me that “your lips but better” look. To an observer, it would be difficult to discern what on my lips – a clear gloss? A lip balm? The effect is very subtle, but it is there. The formula is very emollient and I love the way it feels on the lips. It is hydrating and didn’t dry down on me. In terms of longevity, I have to reapply after about two hours, sometimes sooner. Moonlight is a frosty silver-white. The formula and longevity are similar to Solar Gold, though I would say this is a tad drier. In terms of “sheen”, Moonlight is actually my least favorite of the two. I don’t care for it alone on the lips and if I wear it with a lip color that is on the dry side it doesn’t suit me at all (think Casper the friendly ghost). However, when I pair this with a moisturizing lip color, the effect is lovely. Very subtle, but lovely. So, how sheer is sheer? 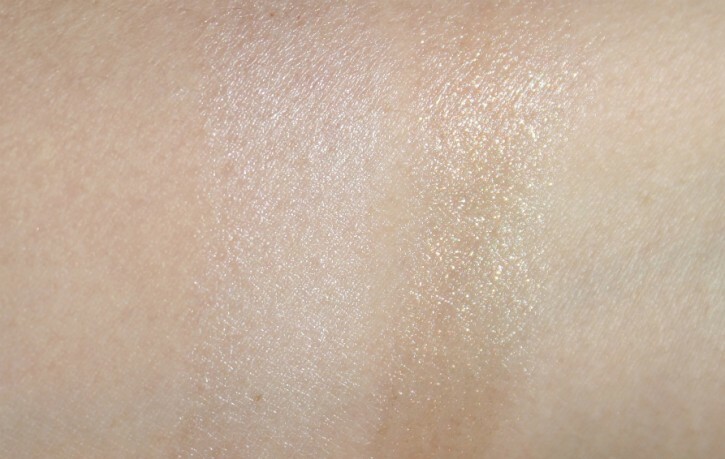 Here are two different swatches, with Moonlight on the left and Solar Gold on the right. As I mentioned above, there is a definite sheen, but it is very subtle. In terms of color, Solar Gold wins in my book. The images below are some quick shots for review purposes taken with an iphone. They aren’t the best quality but you can see the effect that the Lip Shimmers have on the lips. 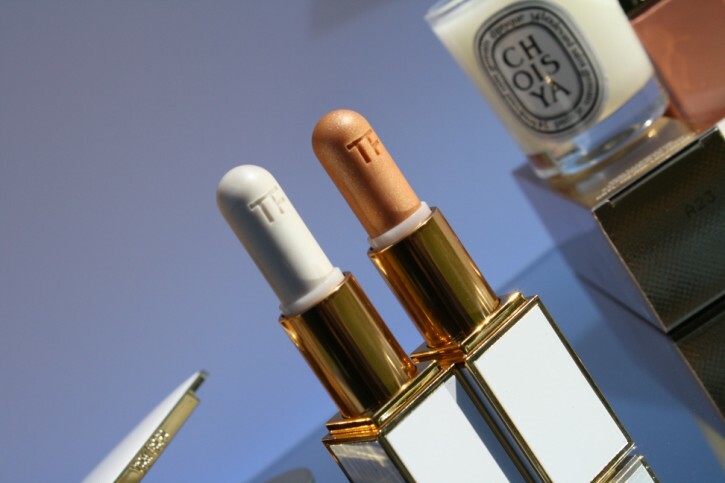 The Good: Emollient formula that imparts a lovely sheen to the lips. I prefer the golden-toned Solar Gold over frosty Moonlight. The Bad: The $49 pricetag. 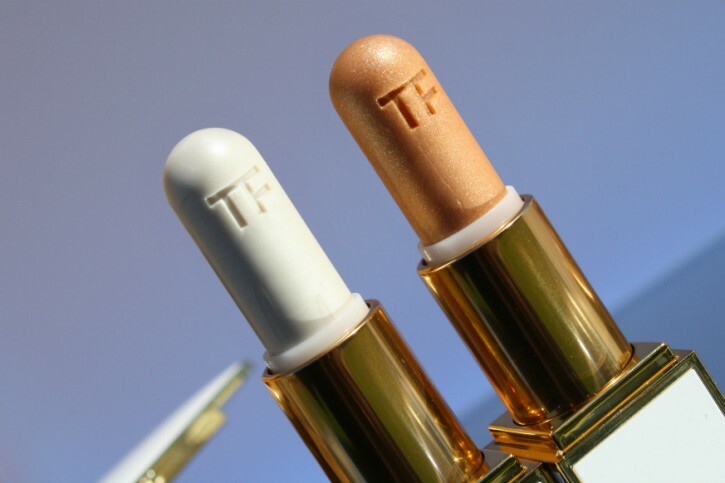 Although I am a fan of the formula, and I like the effect the shimmers have on the lips, I don’t think they do enough to justify the pricetag (the effect is almost imperceptible). I’d rather spend $49 on something with a bit more pigment OR a product intended to be a lip balm. I may change my mind as I use them more, but I don’t see myself running out to buy these. Have you tried the Lip Shimmers? What do you think of them? I would love to try the Solar Gold color! Although I would probably be sketchy about buying it since the price tag is pretty high. Especially since the look is not dramatically visiable. These are neat, I like the Solar Gold one the best. These would be cool if they could be used for any part of the face. Not a fan of the Moonlight on lips but would prob. use it on eyes instead. I love how these look. These would be awesome to try.